The other week it was Nike plastering Kyrie Irving all over the Boston Globe and rejecting the Boston Herald. Adding insult to financial injury, Ashton Kutcher’s two kids do the same today in this full-page salute to their Mom for being chosen Hasty Pudding’s Woman of the Year. One, do they really call their mother by her first name? 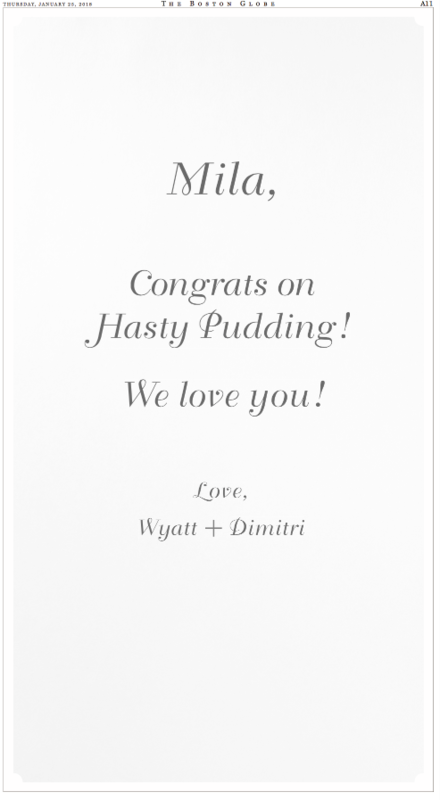 And two, we’re not ashamed to say we had to Google Wyatt and Dimitri to figure out who ran the ad. As for the thirsty local tabloid, maybe Mila Kunis could carry a copy in Hasty Pudding’s traditional parade, which starts in roughly ten minutes despite multiple protests by students and feminists. Missed by a Mila, huh? This entry was posted on Thursday, January 25th, 2018 at 2:36 pm and is filed under Uncategorized. You can follow any responses to this entry through the RSS 2.0 feed. You can leave a response, or trackback from your own site.